In 1917, Chicago business leader Melvin Jones asked a simple and world-changing question – what if people put their talents to work improving their communities. Now, almost 100 years later, Lions Clubs International is the world’s largest service club organization, with 1.35 million members in more than 45,000 clubs and countless stories of Lions acting on the same simple idea: ‘let’s improve our communities’. Just three years after founding, Lions became international. In the 1950s and 1960s international growth accelerated, with new clubs in Europe, Asia and Africa. In 1930, Peoria Lions Club (Illinois) introduced the idea of using a white walking stick as a means of assisting the blind in independent mobility. Lions are proud that today ‘white stick’ laws exist in many countries in the World, providing blind persons a legal status in traffic. The white stick now universally acknowledges that the bearer is blind. 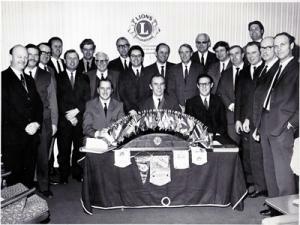 The first Lions Club in England was formed in London shortly after the war, and has now grown to almost 1,000 Clubs in England, Scotland, Wales, Northern Ireland and Eire comprising around 21,000 members. The royal colours of purple and gold were selected as the official colours when the association was organized in 1917. Purple stands for loyalty to friends, and for integrity of mind and heart. Gold symbolizes sincerity of purpose, liberality in judgment, purity in life, and generosity in mind, heart and purpose to those in need. The current Lion emblem was adopted in 1919 and Lions throughout the world are recognized by it. It consists of a gold letter “L” on a circular purple (or blue) field. Bordering this is a circular gold area with two Lion profiles facing away from the centre. The word “Lions” appears at the top, and “International” at the bottom. The Lions face both past and future – showing pride of heritage and confidence in the future. In March 2011, Bradford on Avon Lions Club celebrated 40 years of raising money for good causes. The club started in April 1970 when a group of like-minded individuals met in the Three Horseshoes pub and decided to form a Lions Club in Bradford on Avon, and which was destined to change their lives. Warminster Lions Club greatly assisted formation of this new club and provided assistance for some time. Under the initial presidency of Cliff Hiller they formed a team drawn from a wide selection of professions and business. The Club received its Charter, presented by Deputy District Governor Jim Bolton, at a Presentation Dinner held in St. Margaret’s Hall on 4 th July 1970. The presentation of bannerettes and flags was made by Warminster, Frome, Devizes and Bath Lions Clubs. A Visitor’s Book was presented by Devizes Lions Club and a Bell by Frome Lions Club. See our Photo Archive album ‘Charter Presentation Dinner’. This was the first International Service organisation in the Town and early meetings were held in the Town Club. Bradford Lions’ first project was the purchase and renovation of an ambulance for the St John Ambulance Brigade – see our Photo Archive album ‘Gifting Presentations’. Since then we have organised day trips; caravan holidays; hospice fundraising; supported International Lions Club emergency appeals such as the recent New Zealand and Japan disasters, and the on-going campaign to eliminate preventable blindness; we provide Christmas parcels for the elderly and needy families, from money raised by Santa’s carol float and hold an annual May Day Fun Day and car boot sale. We endeavour to alleviate suffering and to aid – in any form we feel reasonable – the less fortunate folk both in the area and internationally. We have much enjoyed the past 40 years or so and look forward to the next 40, so come and join us and have fun and good feelings while helping those in need of assistance. We are a mixed club and age is not a barrier, it is just a matter of giving some of your time to help others. And we do have very good friendships and social life! To encourage service-minded people to serve their community without financial reward, and to encourage efficiency and promote high standards in commerce, industry, professions, public works and private endeavours. To seek and to demand all fair remuneration or profit as my just due, but to accept no profit or success at the price of my own self-respect lost because of unfair advantage taken or because of questionable acts on my part. To hold friendship as an end and not as a means. To hold that true friendship exists not on account of the service performed by one another, but that true friendship demands nothing but accepts service in the spirit in which it is given. Always to bear in mind my obligations as a citizen to my nation, my state, and my community, as to give them unswerving loyalty in word, act, and deed. To give them freely of my time, labour and means.